The two runners likely to vie for favoritism are situated in outside post positions. Looking Ready (#8) drops in class out of open-company stakes races and switches back to dirt. 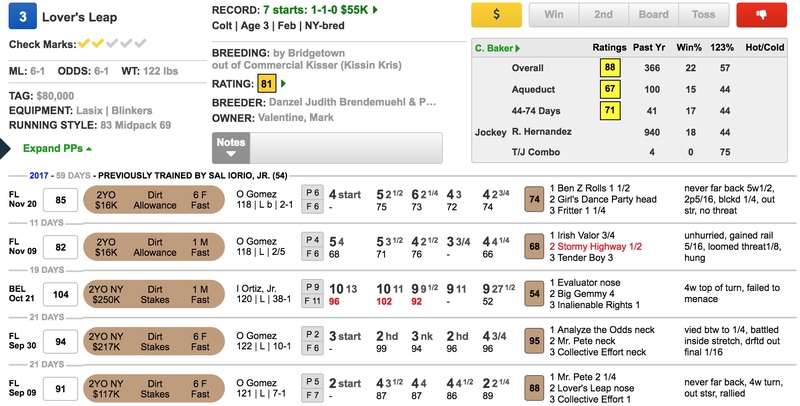 While he ran into some nice horses in his first two main-track starts at Saratoga, including stakes winners Alveenu Malcainu and Sea Foam, he will need to run a bit faster than that to take down the top prize here. That’s certainly possible since those races were run back in the summer of his 2-year-old season. Looking Ready’s task is complicated by the presence of Flash Drive (#9) just to his outside. This speedy Chris Englehart trainee comes into this event having earned the highest speed figures in the field, and you can be sure that Paco Lopez will be aggressive from the starting bell. Flash Drive has faced only maiden company, but he’s nevertheless competed against some quality rivals, having led until deep stretch against subsequent Damon Runyon winner Empire Line two back. Looking Ready figures to be chasing Flash Drive early, as will fellow speeds like Nine Route and My Man Mo, so the early pace should be honest. Therefore, I’m trying to beat these two with closer LOVER’S LEAP (#3). I know that he appears to be a bit slower than some of his main rivals, but there’s reason to believe he will improve here. He’s getting a significant trainer upgrade, going from the barn of Sal Iorio Jr. (54 TimeformUS Trainer Rating) to the stable of Charlton Baker (88 Trainer Rating). Furthermore, Baker has solid numbers off trainer switches like this. Over the past five years, he is 5 for 21 (24 percent, $2.32 ROI) first off a trainer switch on the dirt at NYRA. Lover’s Leap has run better than it appears on a few occasions, and now he also gets a positive rider switch to Rafael Hernandez.